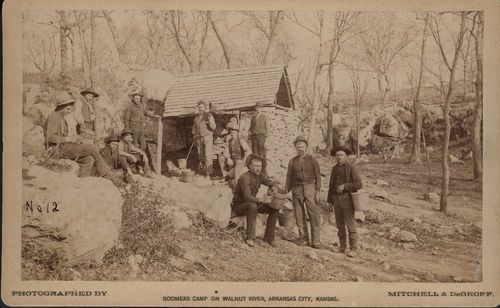 This sepia colored photograph shows a group of "boomers" near the banks of the Walnut River in Arkansas City, Kansas. The "boomers" were white settlers who were attempting to settle in the Indian Territory of Oklahoma. Some of the "boomers" would camp near the Kansas and Oklahoma border waiting to enter the territory to claim land that had not been assigned to Indian tribes. Many of the settlers believed that the unassigned land was in the public domain under the Homestead Act of 1862. The land was some of the last that had been set aside for the settlement of Native American tribes after they had been removed from their ancestral lands.